The SATO XL410e has been discontinued. No direct replacement is available. 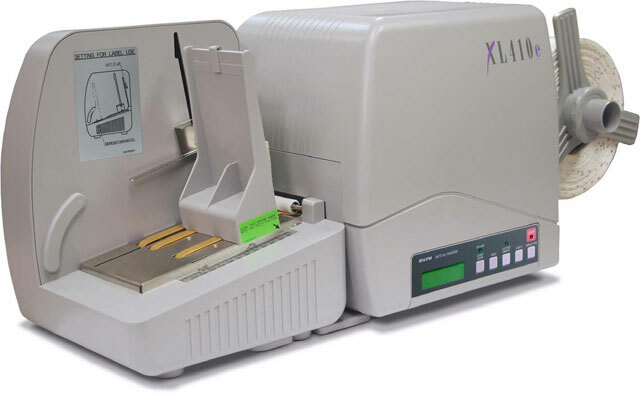 Labels, Tags, Tickets and More: The XL410e can Handle it All! The XL400e, which prints, cuts and stacks, is highly valued in the textile tag and ticketing industries. The movable sensor allows for an endless choice of media. The intelligent printhead regulates the printing temperature, thereby optimizing the print quality. A state-of-the-art RISC processor is at the heart of the XL400e, ensuring a high-speed printing process. The use of the cutter, and stacker enable you to select a solution suitable for your individual application. 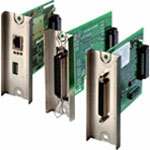 XL410e, Thermal transfer, 305 dpi, 6 ips, RS-232 Serial and Ethernet interfaces. XL410e, Thermal transfer, 305 dpi, 6 ips, RS-232 Serial interface. Thermal Labels, 1.5" x 2.75" Direct thermal 7pt. paper tag. 3200 tags/roll, 2 roll case. Thermal Labels, 2.75" x 1.25" Direct thermal 7pt. paper tag. 7000 tags/roll, 2 roll case. SATO's XL410e printer includes a heavy-duty print mechanism and cutter assembly. Its industrial chassis and 32-Bit RISC high performance processor tackles even the most demanding print jobs with ease. Max. 9.84" (250 mm) Roll O.D.